We love everything about the beach. The sand, the sound of the waves, and that salty beach air! Bring the beach to your house with these beach crafts to make this summer. Make a whole family of jellyfish with this fun paper bag craft. You’ll need a few paper bags and some paint to complete this craft. Gather a little sand from your beach for a fun craft. Use this sand from your beach vacation to make these glitter sand pictures. Draw different beach scenes to celebrate summer. 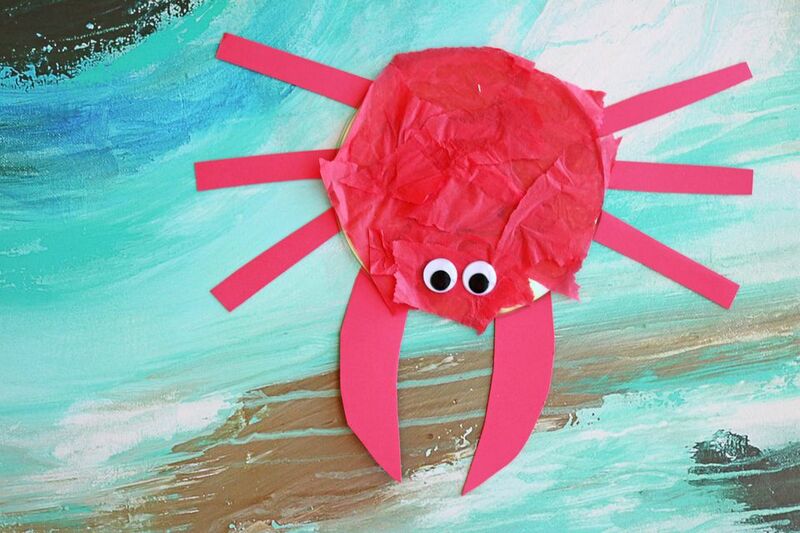 Recycle old CDs to make these cute little crabs. This is a great indoor craft to bring the beach inside on a rainy or cloudy day. Have some fun with googly eyes and shells and craft these cute little shell pets! These are perfect summer friends that can be transported anywhere and make for a little pretend play at the beach. Collect driftwood from the beach to create these beautiful color-blocked necklaces. Show off your hard work and wear them all summer long. You’ll need lots of different shapes and sizes of sea shells for this craft project. Paint them all of the colors of the rainbow for a super fun beach craft. Display beautiful artwork with these beach stone photo holders. These would be perfect for a party to display for summer. Find solid and smooth beach stones to complete this craft! These shell people are easy to make and super fun to play with. Aren’t they adorable? Your kids would LOVE this project! Have any more CDs laying around the house? Turn them into these fun and creative fish. Grab some string and hang these as a beachy mobile in your child's room.